The September Greater Atlanta Coin Show saw many visitors on a pretty pre-fall day that was warm but not unbearable. As always, we appreciate each and every one that supported and participated in the monthly show. We thank the many visitors and the many dealers who packed the bourse with displays and discussions about the various numismatic and collectible items. This month the show also enjoyed an increase in young people interested in the science and art of coin collecting. We are always happy to see younger folk showing an interest in the study of money. Here's a big welcome and thank you for joining us to the guest dealers on the bourse who took the place of several of our regular dealers that participated at shows in North Carolina, Tennessee and Mississippi. Next, we thank our security for keeping watch over the dealers and the guests. Also, we thank the hotel's staff for supplying the bourse. In summary, September was another interesting and successful coin show. Though the county is experiencing level 2 drought conditions, the weekend was beautiful with mostly sunny skies and temperatures in the 80s. Several people arrived on Saturday and noticed a full parking lot while the hotel hosted two separate weddings. As a side note, one of our hotel support staff visited the show and initially thought the dealers only displayed American coins. That's a misconception. The many dealers on the bourse display a broad range of interests. There are ancient coins such as coins from the Greeks and Romans to examples of the coins mentioned in the Bible such as the widow's mite. Coins used in early American trading before the US Mint can be found on the bourse from early colonial strikes to the Spanish and British coins of that era used in the colonies. Then, of course there are US Mint coins from the early days to the varieties struck in 2016. But, the study of money is not just coins. Numismatics also includes paper money. Several dealers display collectible currency from the earliest versions to the more modern collectible examples. And, that's not all the dealers display. You can also find gold and silver jewelry, beautifully crafted stock certificates, precious and semi-precious stones and numerous other collectible items as well. Getting ready for next year's shows, at the September show, we provided the new flyers for the 2017 monthly coin shows. Also, the 2017 events have been added to the Show Dates page. Let's take a look at a few of the collectibles displayed on this month's bourse - a couple of gold coins and a couple of silver medals. First is a blue box with a blue velvet clam shell holding a Gold American Eagle coin. Of course, for this beautiful coin, you have to remember your Roman numerals: M for 1000, C for 100, L for 50, X for 10, V for 5 and I for 1. The coin's date is MCMLXXXVI, but why are there two "1000s" separated by a "100?" That's the short tour for this month. Next month, the coin dealers will again pack the bourse with their wide variety of numismatic displays from domestic to world, old to new and with many examples to intrigue visitors. Mark your calendars to visit the next monthly Greater Atlanta Coin Show on Sunday, October 9, 2016. If a smaller Roman numeral is to the left of a larger value, you subtract the smaller from the larger to the right. The first M is 1000, the CM is 900 (1000 minus 100), the L is 50, the three Xs add to 30, the V for 5 and the I for 1. Add those together: 1000 + 900 + 50 + 30 + 5 + 1. The coin's date is 1986. At one ounce of fine gold, isn't she pretty? 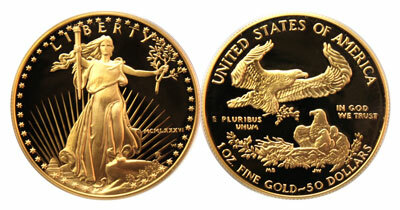 The 1986 version began the Gold American Eagle series with its $5 Tenth-Ounce, $10 Quarter-Ounce, $25 Half-Ounce and $50 One-Ounce versions. 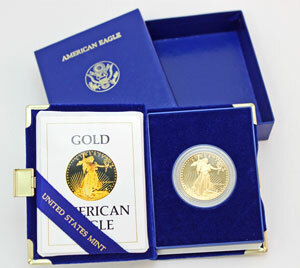 The US Mint produces both proof and uncirculated versions of the Gold American Eagle coins. They supply the collector market with proof versions but sell the bullion (uncirculated versions) only to approved dealers from which collectors and investors can purchase the golden ladies. This example shows the US Mint's artistry with the proof version. The obverse showing "Liberty Standing" is a slight modification of the design on the $20 gold coin designed by Augustus Saint-Gaudens initially produced in 1907. 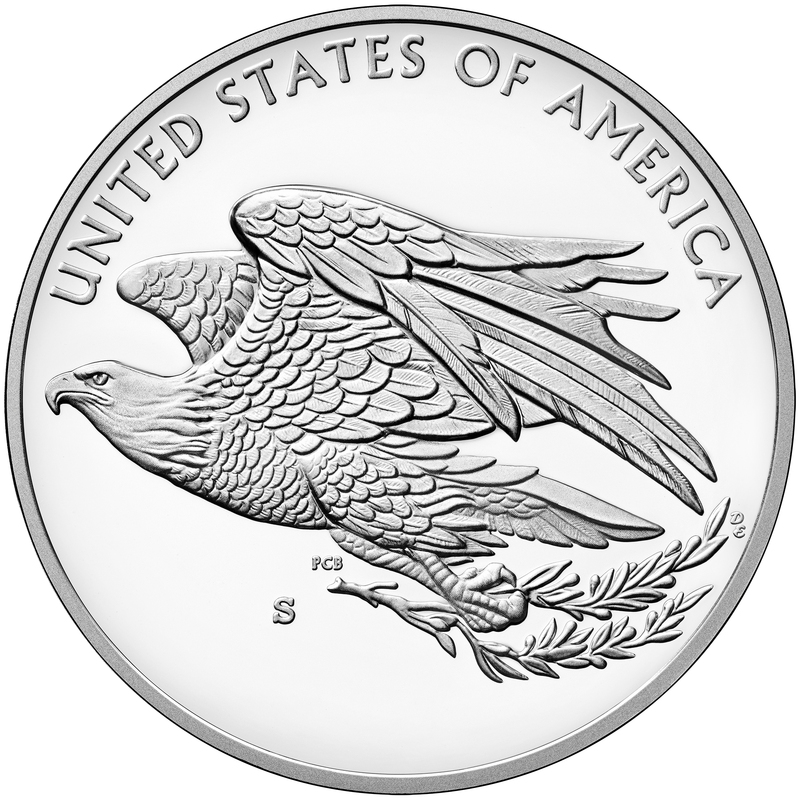 The reverse by Miley Busiek shows a family of eagles "symbolizing family tradition and unity" per the US Mint. 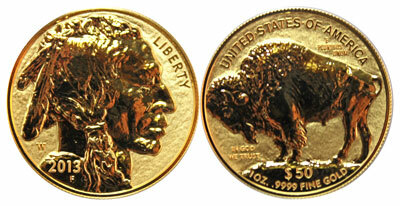 Next on our list is another $50 gold coin, this time a reverse proof of the American Buffalo made of one ounce of .9999 fine gold. The US Mint started the American Buffalo $50 gold series in 2006 and in 2008 even struck $5, $10 and $25 coins of tenth-ounce, quarter-ounce and half-ounce, respectively, all made with .9999 fine gold. The West Point Mint produced the reverse proof American Buffalo gold coins in 2013, the only year, to date, for the reverse proof. This coin highlights the James Earle Fraser design initially produced on the Indian Head or Buffalo nickel in 1913 and continued until the last in 1938. The obverse shows a distinguished Native American with the American Buffalo portrayed on the reverse. The next coin on our tour for September is a medal rather than a coin - the American Liberty Silver Medal. Just a few weeks ago, the US Mint offered a limited number of these medals, 12,500 each at San Francisco and West Point. At a limit of two per household, the medals quickly sold out. In addition to the gold bullion and the five-cent coin, the US Mint produced Mr. Fraser's iconic emblems of America on a commemorative coin in 2001. On all the different types of these coins highlighting his design, Mr. Fraser's initial - just his last initial - can be found under the last two digits of the year on the coin's obverse. Both the gold coin and the silver commemorative coin use the "mound" variety under the buffalo whereas most of the nickels used more of a "straight line" under the buffalo's stance. In addition, the five-cent coins and the silver commemorative dollar contain the mint mark, if there is one, on the reverse centered under the buffalo and under "one dollar" or "five cents." For the Gold American Buffalo, the US Mint moved the mint mark to the obverse just to the left of the Native American gentleman's neck. "The 2016 American Liberty Silver Medal, minted at the West Point Mint, is the latest in that new era, rendering contemporary designs using the latest in modern digital and manufacturing technology. Medal images courtesy of the US Mint. 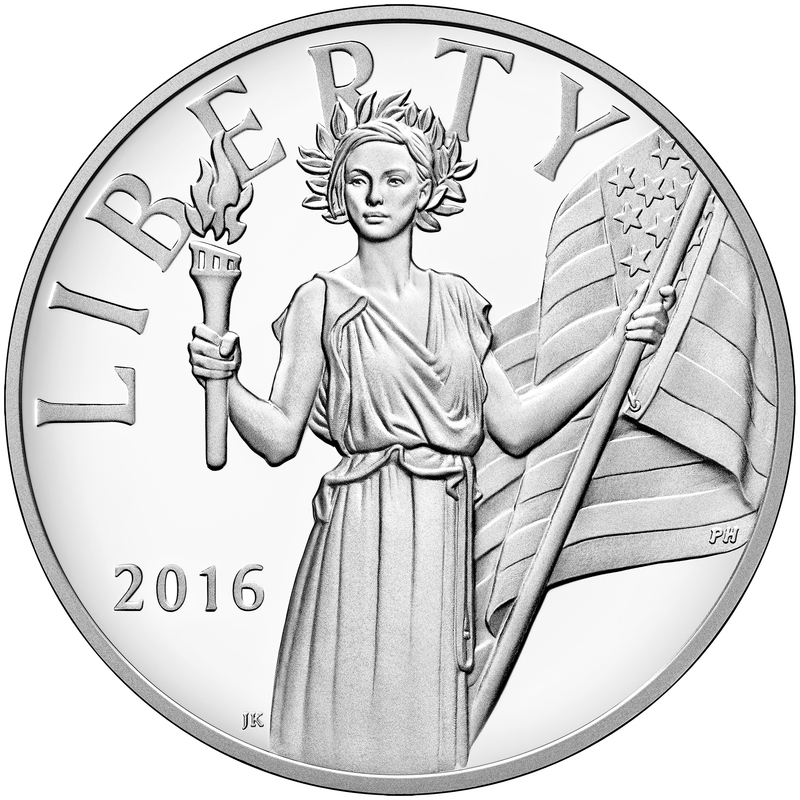 "United States Mint Artistic Infusion Program Designer Justin Kunz has created a modern depiction of Liberty for the obverse (heads), evoking the ideals of liberty, courage, and hope. Artistic Infusion Program Designer Paul C. Balan’s reverse (tails) design depicts an American eagle rising in flight, gripping a branch in its talons as an embodiment of freedom." Both medals, one minted in San Francisco and one in West Point, contain one Troy ounce of .999 fine silver and are produced with a proof finish. Many collectors ordered their maximum of two of each. Last on our list for this month is another Philadelphia Set. Is it the same one mentioned in the August notes or a new one? Rather than a repeat of last month's comments, let's compare the obverse of the Philadelphia medal with an image of its inspiration. Frank Gasparro of the US Mint developed artwork based on the 1914 painting by John Ward Dunsmore titled "Inspecting the First Coins." 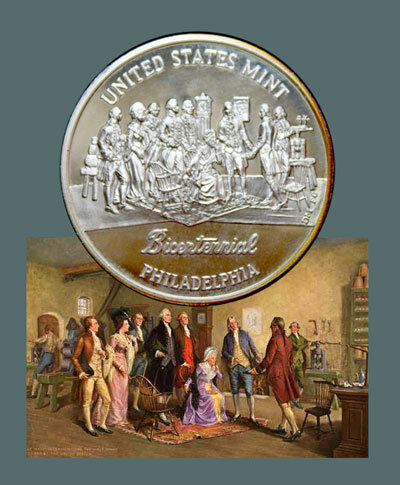 Don Miller transformed the original artwork into medallic art for the production of the Philadelphia Bicentennial Medal. At 90% silver and 0.76 troy ounce, this medal does not contain as much silver as the newer American Liberty medal, however with production of 12,689, not two times 12,500, the older Philadelphia medal is more rare. Regardless, each of these, whether coin or medal, gold or silver, is a beautiful specimen for any collection.